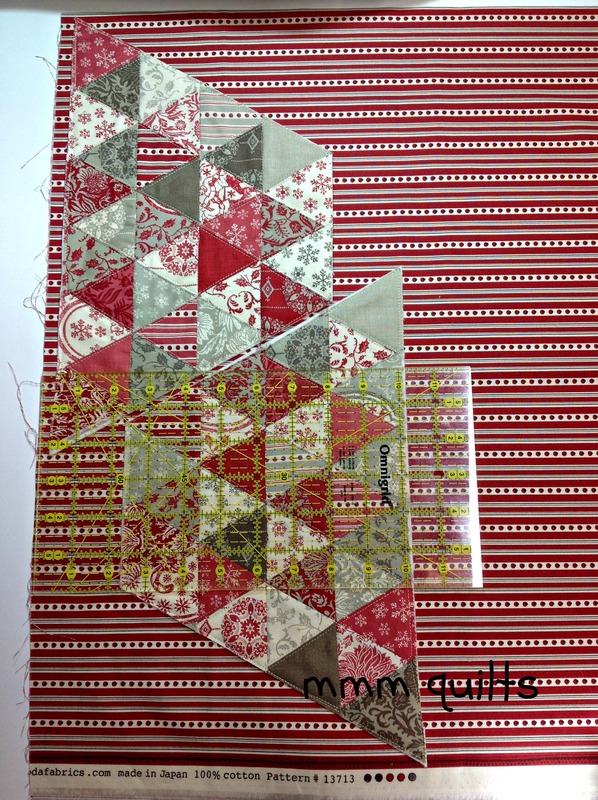 Cut the charm squares you have chosen for the bag body in half to yield two rectangles 2.5”X5” per charm square. Thus, 16 charm squares will yield 32 rectangles; 32 charm squares will yield 64 rectangles. We will be cutting 60° triangles from these rectangles. 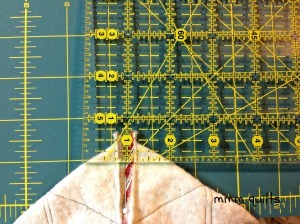 You can make a template out of template plastic or paper, but I just use the angle lines on my 12″ Omnigrid ruler. Place your ruler on the charm square with the 60° line along the bottom edge. Cut as shown. Turn the entire mat around if you’re working on a small one, as I am. 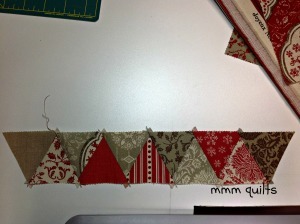 Otherwise, carefully turn the strip around (remember bias edges are very stretchy). 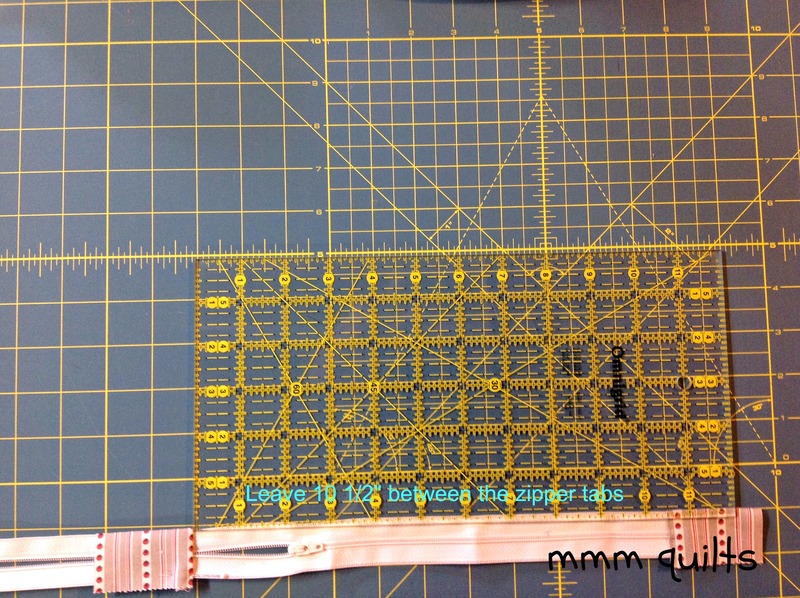 Line the 2.5″ line up along the just-cut edge, and the 60° line along the bottom edge of the strip as shown. Cut. 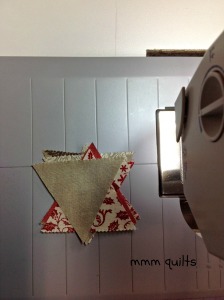 You will have a diamond shape that is 2.5″ wide and 2.5″ high. 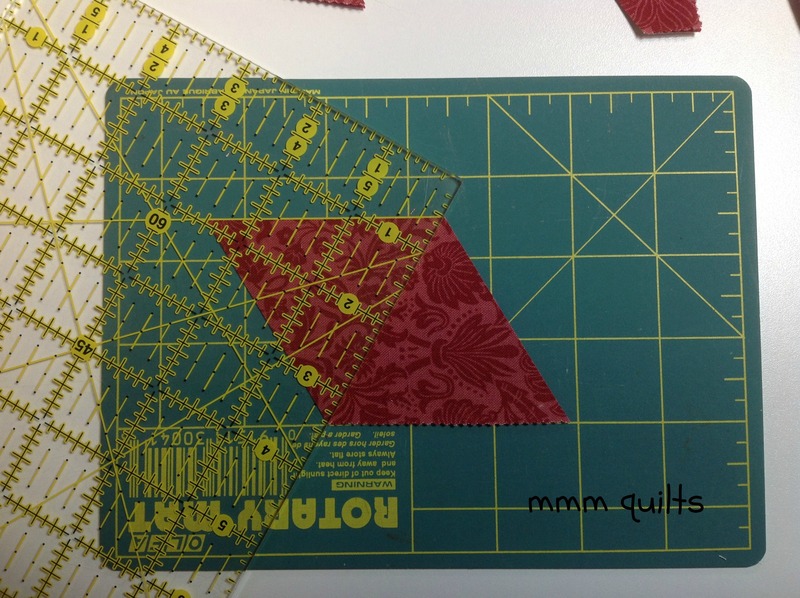 Now line up the 60° line along either the top or the bottom of the strip (sometimes you have to finagle (technical quilting term uh-huh) the ruler a bit to get the edge for cutting in the right place), and the cutting edge of the ruler from wide-angled point to point of the diamond. Think of it as cutting across the shorter distance of the two point-to-point distances. 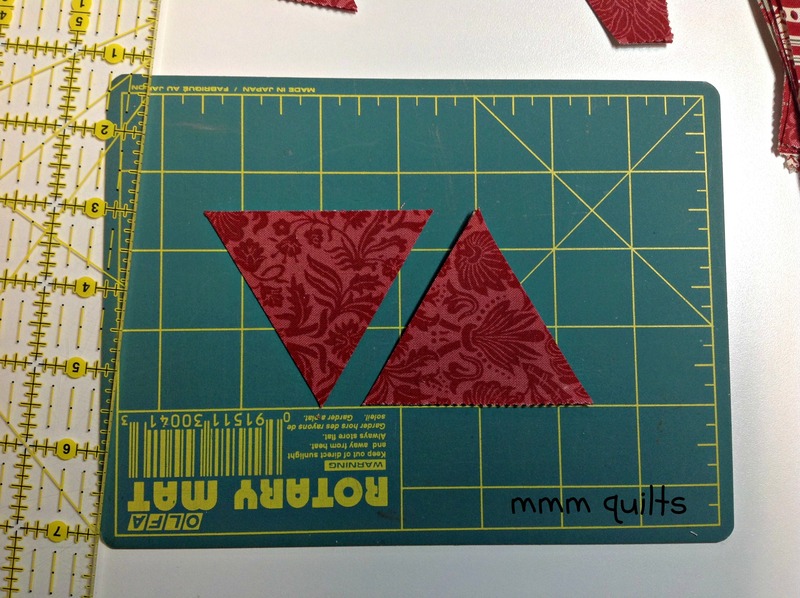 Continue cutting until you have 64 triangles. 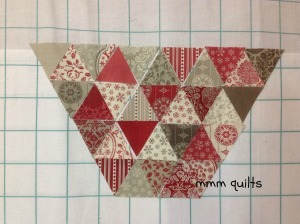 You can stack 2-4 rectangles on top of each other if you like to speed up the triangle-cutting process. 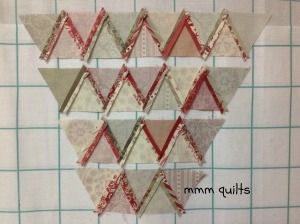 I also like to stack all the triangles in the same direction, points up, with the straight grain base at the bottom (very important to keep your quilt or pouch from stretching out of control). 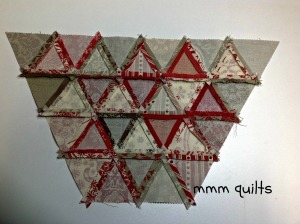 As I cut the diamond into the two triangles, I make two stacks of 32 identical fabrics, one for each side of the pouch. **If you have cut both halves of the charm square into triangles, you will have 4 piles of 32 triangles each, enough for two pouches! Once you have enough, go to your design wall and set them out in a 4-row grid. The bottom row has 5 triangles, the second has 7, the third has 9 and the top row has 11 triangles. You will have a pyramid shape. Make the second side in the same way; since each side is made up of the exact same fabrics, it is your choice whether you make the second side exactly the same or whether you do a different arrangement. Tip: DO take a pic of the final arrangement on your design wall for reference when sewing these together; I might have learned that the hard way. Assemble top row: Stack your top row triangles one on top of each other from left to right so that the far left triangle is on the top of the pile of 11, and the far right triangle is on the bottom. 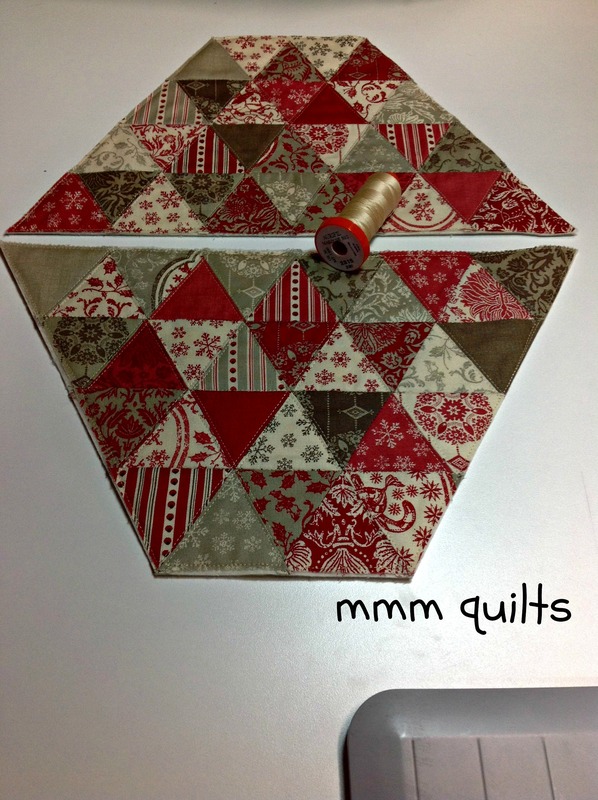 Take them to your machine, and set them to the left of your needle. 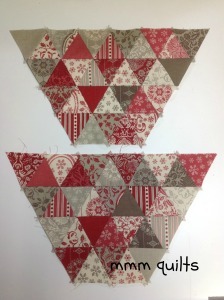 Take the top triangle off the pile and leave it point down. The straight of grain side should be at the top, and the two sides going up from the bottom point will both be bias. 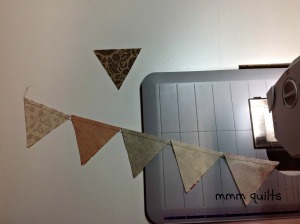 Take the second triangle and place it beside the first. 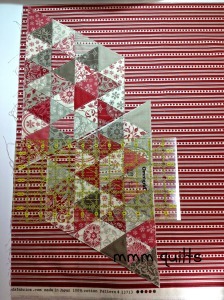 This 2nd triangle will be on its base, its straight of grain base. Going up from the base are the two bias sides. This will ensure that your rows will all have parallel straight of grain edges, preventing wonkiness and stretching. 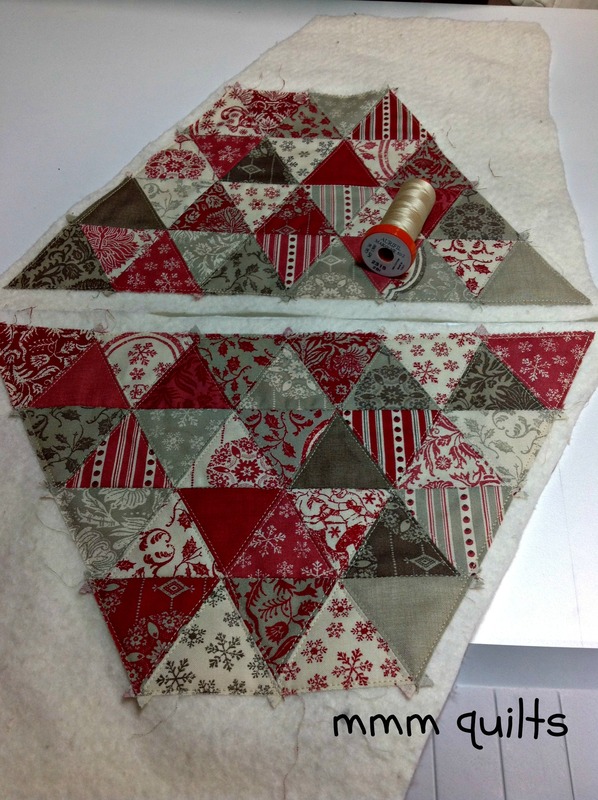 Flip the second triangle onto the first, right sides together, and sew slowly and carefully as you have two bias edges being sewn together. Continue on in this manner, chain piecing the entire row. You will have 5 pairs and one last leftover triangle. Remove the chain from your machine. 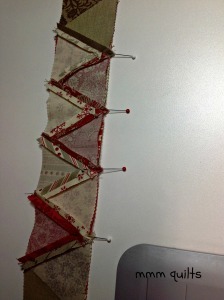 Tip: keep the tail of thread on the first pair of triangles as a way to remind you this is the left side of the row. 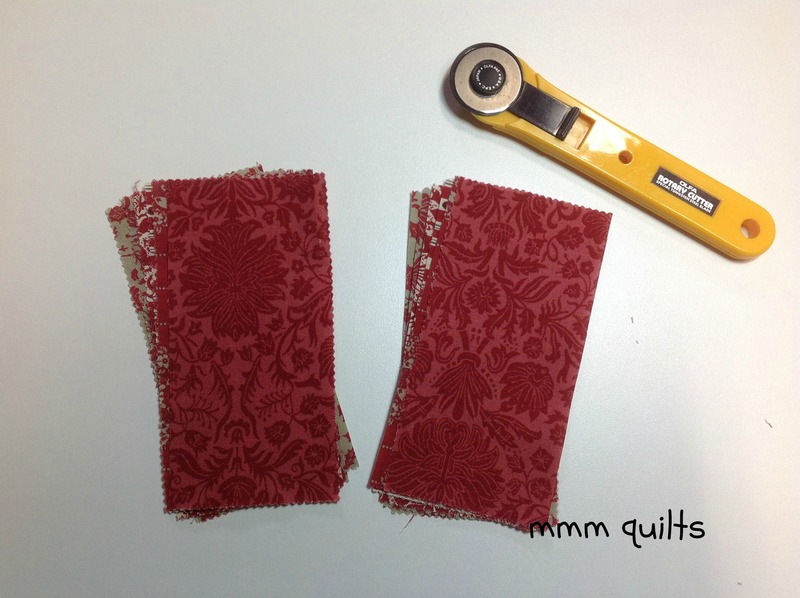 Cut apart the first two pairs only, finger press the seams open, and place one atop the other as shown. 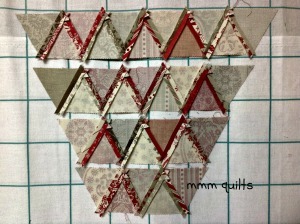 Note that the first pair, with the far left triangle in the row, and the little tails of thread, will be on the bottom. You can place a pin as I did if you like, (love my Clover fine pins) but it’s optional. Do not cut off the little ears! 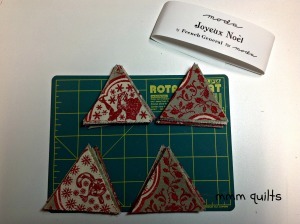 These will help to align the triangles so you will get perfect points. 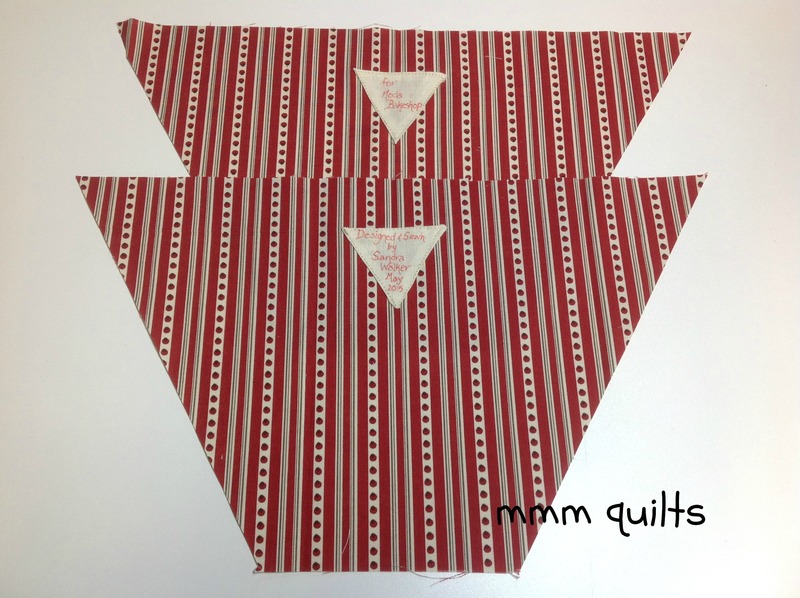 The “ears” of the finger-pressed seams in the bottom triangle pair will help you line up the points of the triangle on the top pair! Once the entire row is sewn, press with an iron, no steam, press, don’t stretch. It’s hard to tell in the pic above, but the ears of the right-side-down row lie exactly on top of the ears of the right-side-up row. Its partner ear lies along the raw edge. 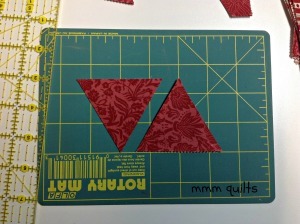 You can also use the teeny triangle (it’s the red triangle you see between the ivory and taupe fabrics that the stylus is pointing to) seam-line as your guide to sew: go right through that seam-line, as it is the top point of the triangle. 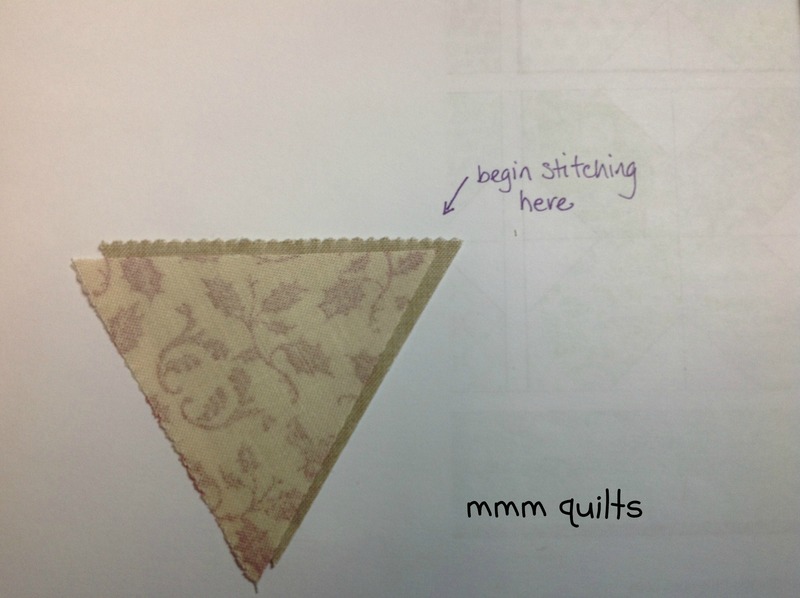 This will probably make more sense when you are sewing it. In the photo below, see how I am going to sew right through the point where the finger-pressed seam intersects the raw edge? 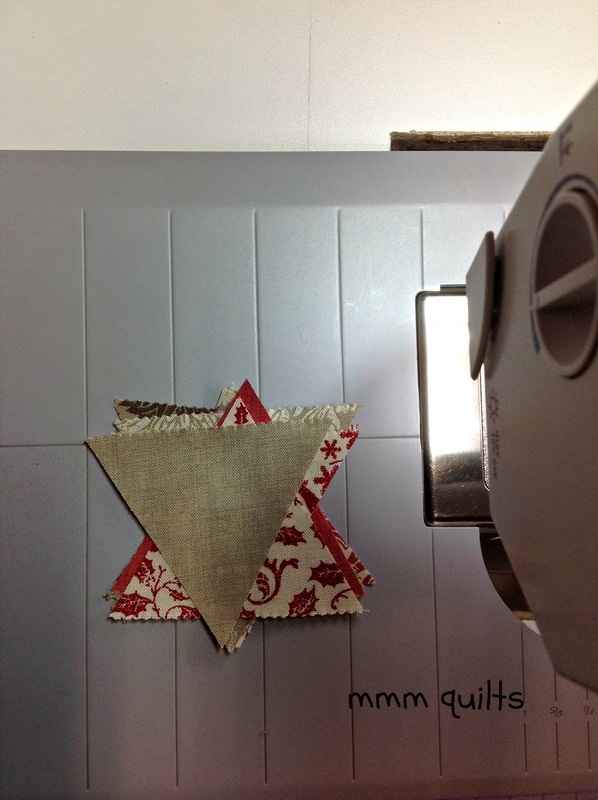 I know when I first started quilting finding all these little aids to align things really helped me! Make the second side as you did the first, either identical or different. Mine is different, although all 32 triangles are the same fabrics! Layer one assembled side on top of the batting. 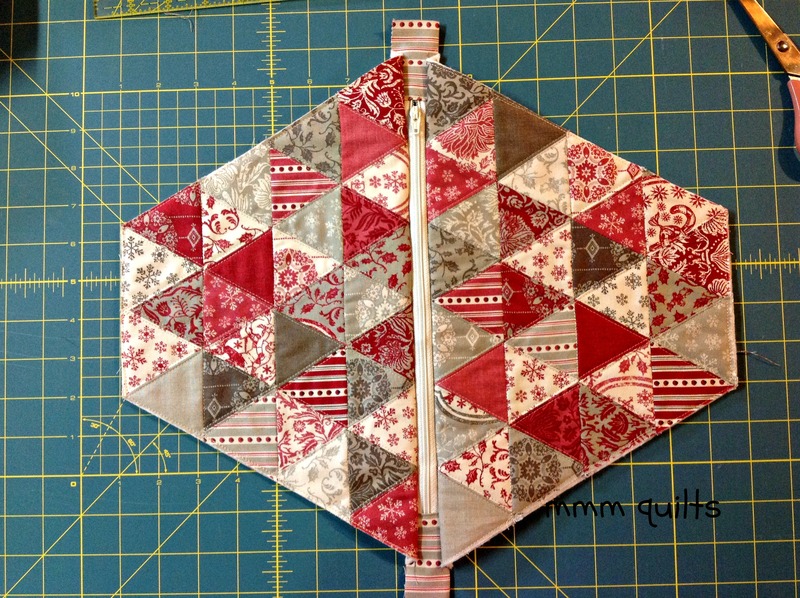 Pin or spray baste to hold the layers. 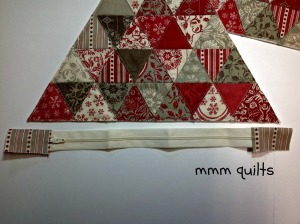 Of course, you may simply apply iron-on interfacing to your pyramid side, and skip the quilting. 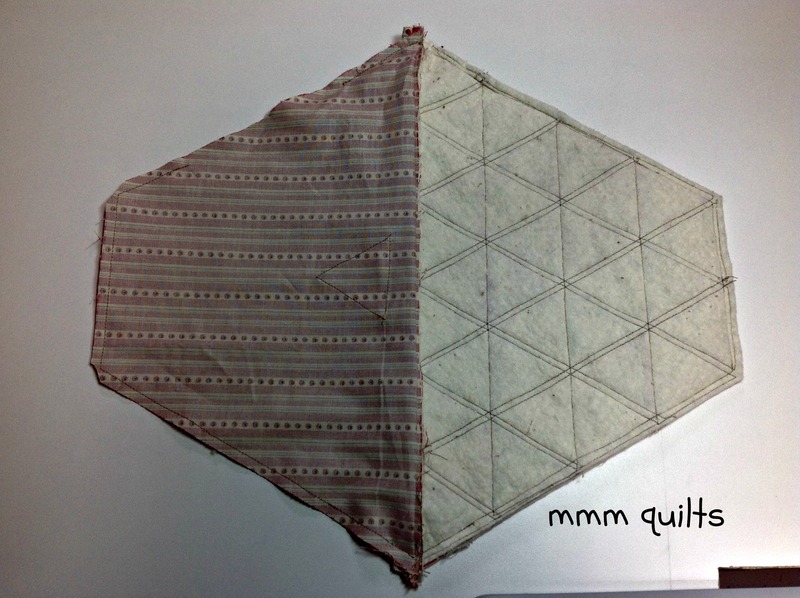 A third option, if you want a very stiff pouch, is to do both: quilt and interface. 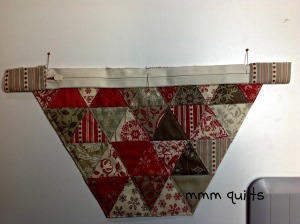 Use the two bag body sides as your pattern to cut your lining pieces from the fat quarter of fabric. 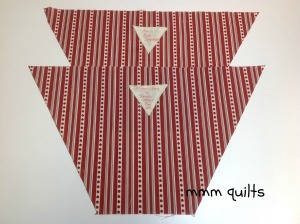 I just love a striped lining! 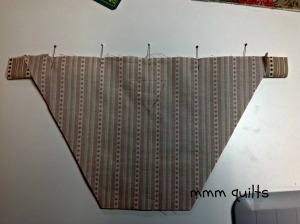 I cut the pieces so the stripes will be vertical within the bag. This is the time to apply a label, so if you put aside a solid-reading charm square, and if you wish to make the triangle label as I did, then cut the charm square in half as you did for the other triangles, so you have a 2.5X5” rectangle. 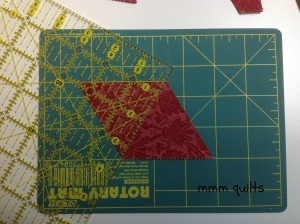 Cut this rectangle as before into (2) 60° triangles. Press under the seam allowance a very scant ¼”. Trim the overlapping fabrics at each point. Use an archival ink pen to record any information you like. Fold the lining piece in half to find the vertical centre. 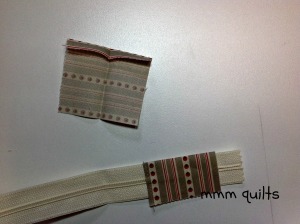 Align the top edge of the label so it is about 1 ¼” down from the raw top edge of the lining. Topstitch it about 1/16” from the edge of the label. 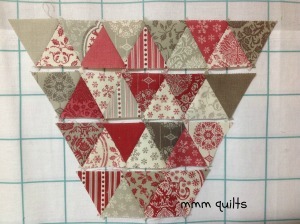 From another one of the leftover charm squares, cut (2) 2 ½” squares. Press one side under a generous ¼” and then press each one in half. 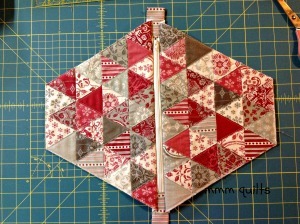 Take one of the tabs and fold it over one end of the zipper. 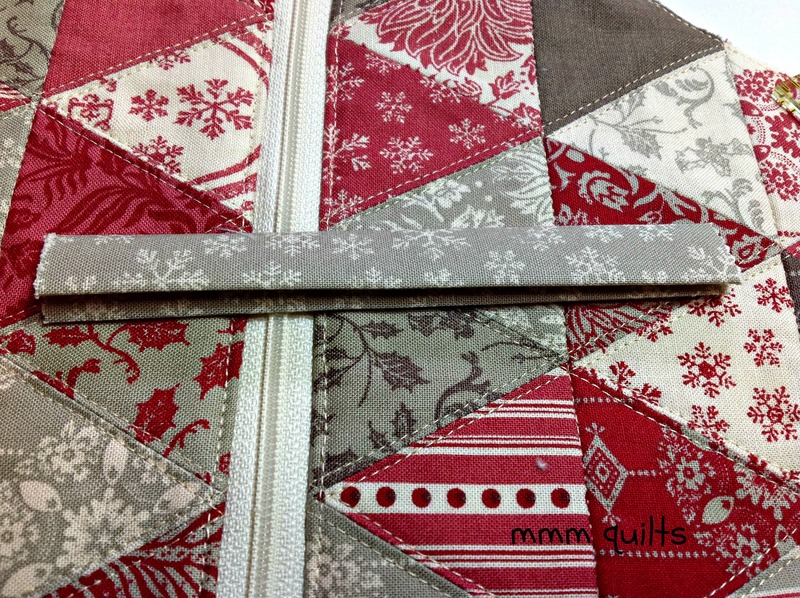 Topstitch along the folded edge, encasing the zipper inside the 2.5” square. Open up the tab and trim the zipper to ¼”. Leaving 10.5” between the zipper tabs, encase the zipper inside the second 2.5” square, topstitching as you did the first one. Be sure to open the zipper so the pull tab lies between the two new stops. and then lining face down. 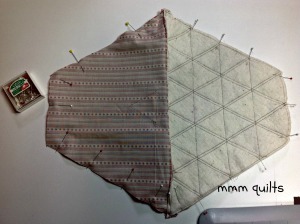 Pin or baste the layers together. 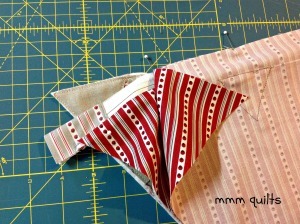 It’s okay that the zipper tabs are sticking out; you will trim them later. If you usually sew, as I do, with a single-hole throatplate, change it now, (or you will break a needle, yep been there done that, more than once) and put on your zipper foot. 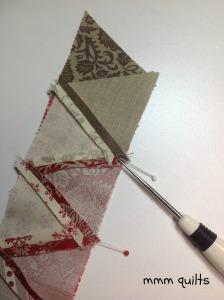 Sew slowly, backstitching at each end of the seam. 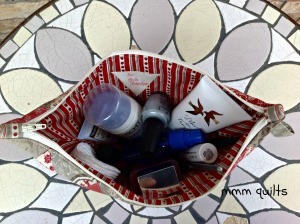 Open the now-encased-edge-of-the-zipper seam and carefully fold away both the bag body and the lining. With wrong sides of the bag body and the lining together, topstitch on the bag body side. You can do that step before you sew on the second side or not. I’ve done it both ways without any difference. I like to put on my walking foot as there’s a fair amount of thickness to deal with. 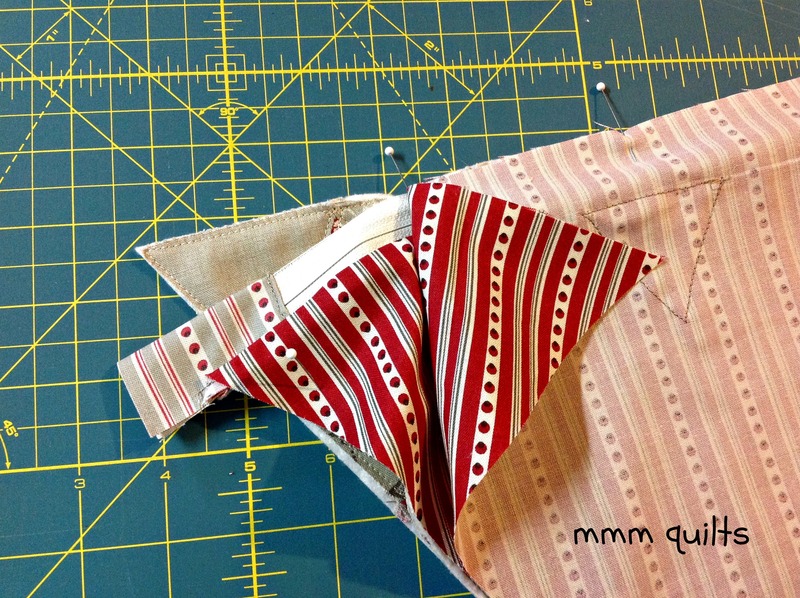 Tip: for a nice straight line of top-stitching, open the zipper a little ways. 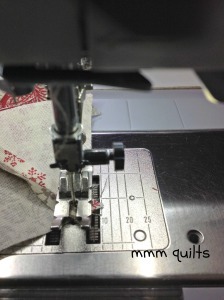 Sew up to the zipper stop, lift your presser foot with the needle in down position, carefully close the zipper so the stop is now behind your walking foot, and then continue top-stitching. 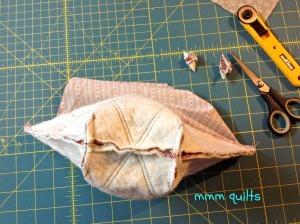 I also do this when I’m sewing the bag body, zipper and lining sandwich. 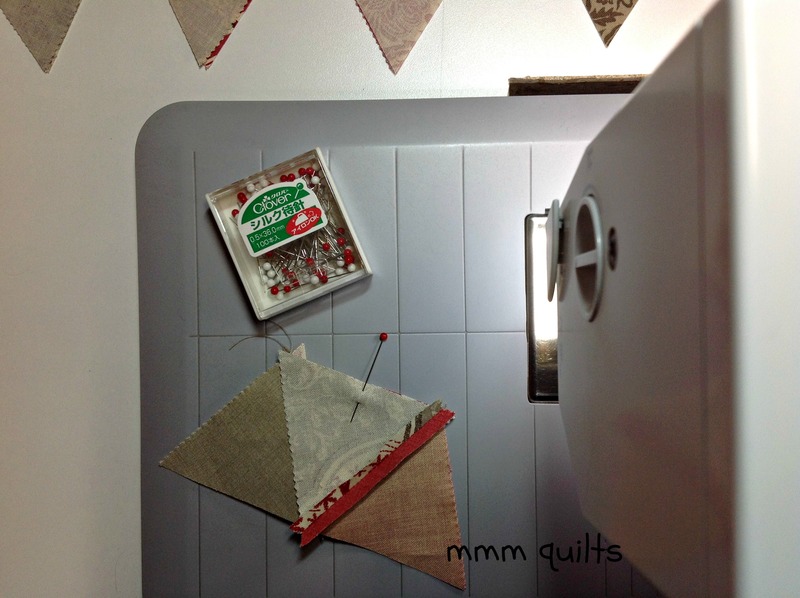 For the little pull tab/handle, choose another one of the leftover charm squares, and cut it in half making a rectangle 5” x 2.5″ wide. Fold in half and press, and then open and fold the raw edges to meet at that pressed centre fold. Now, to sew it all together. First, make SURE your zipper is OPEN. Then match the raw edges of the lining together, and those of the bag body together. Pin. Leave about a 5″ opening on one side of the lining. 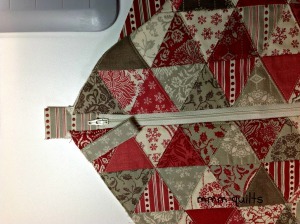 This is where you will turn the bag right sides out when you’re done sewing. I put a different colour of pinhead (yellow) here so I will remember to stop/start at these points. 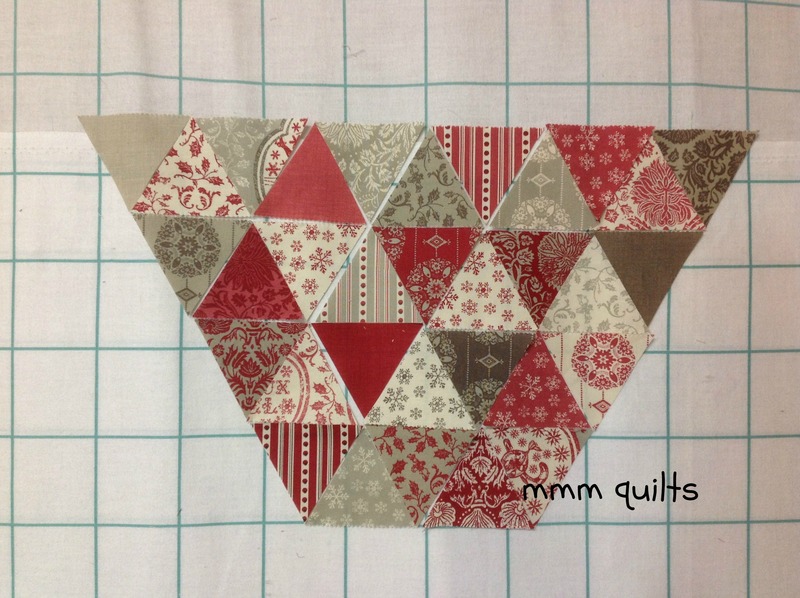 This is a point where you might realize, as I did, that I missed an entire diagonal of topstitching! Did you notice in all the previous pics?! Never fear, I went back in and did it, remembering to move the lining out of the way! Now the ears are all cut off, but it’s still easy to match the triangle points simply by looking at your quilting lines, wiggling together the two points so they meet, and dropping a pin right there. 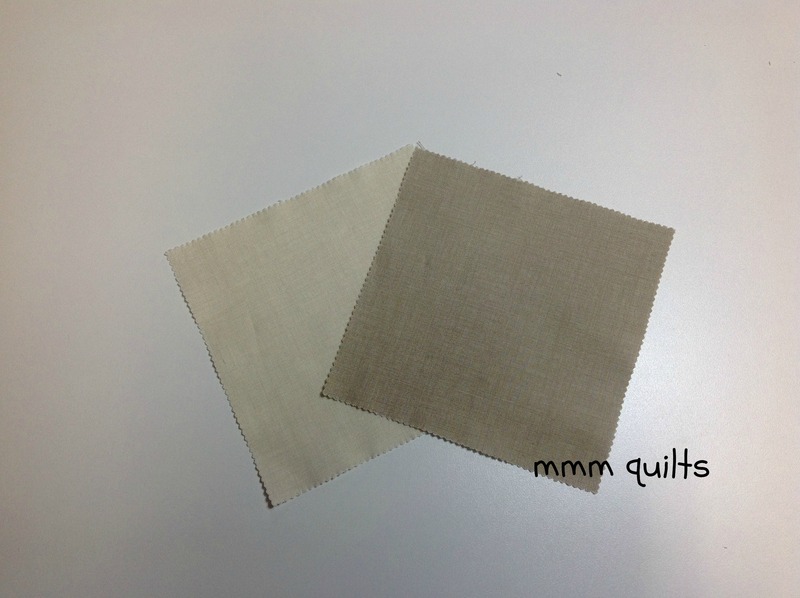 Tip for when you get to pinning the lining: push the zipper tab fabric, which doesn’t seem to have any place to go, towards the lining side, NOT the bag body side. This will make sense when you’re pinning and you get to that point. Backstitch at the beginning and end. I use my walking foot here again. I also use Clover pins (love ’em) not the clips because I often sew (usually slowly) over (gasp) the pins. 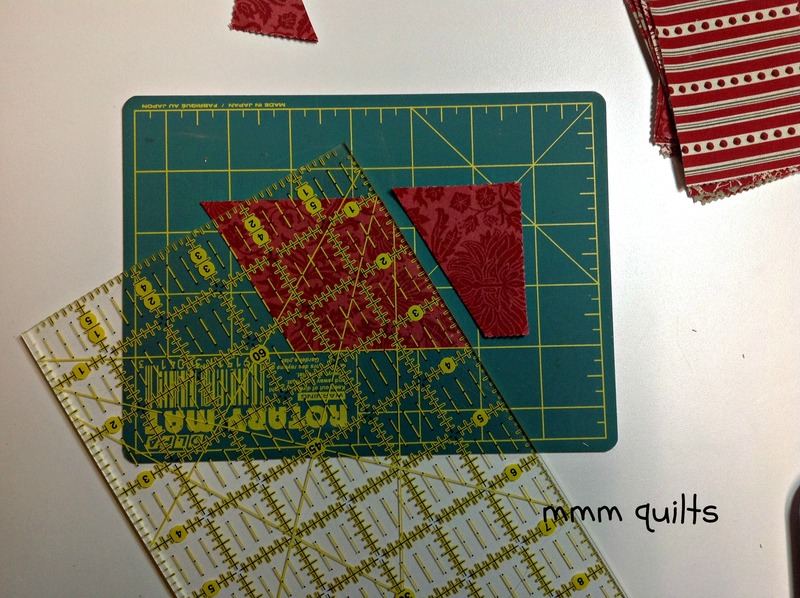 Tip: I also backstitch over the place where I’ve basted the pull/handle to give it extra stability. 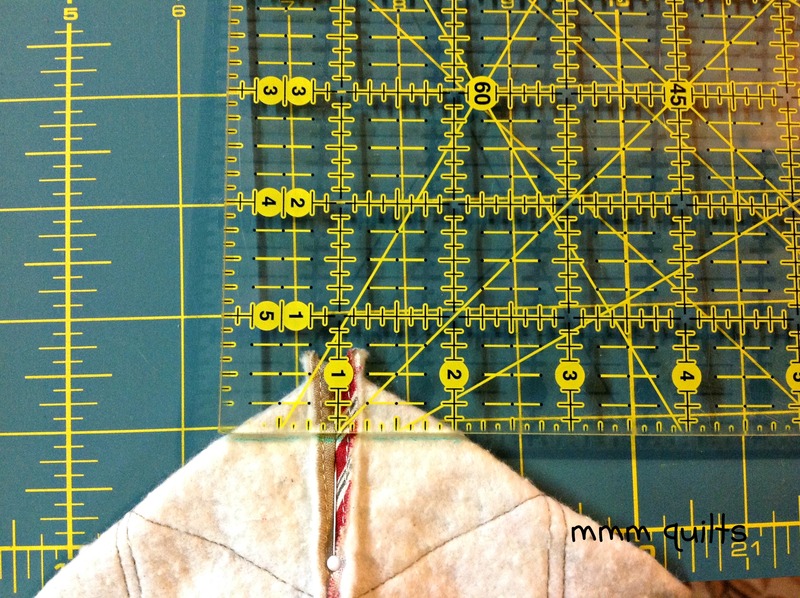 You can trim the zipper tabs now too, and trim down that corner between the bag body and lining to reduce bulk. Line up the seams (finger press them open) of the side to match those of the bottom. 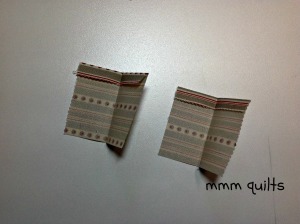 You can pinch them first and pull them out through the hole in the lining to double-check. Pin. 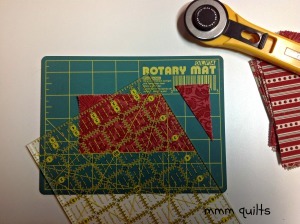 Place your ruler so that you have a 2″ line perpendicular to the seams. 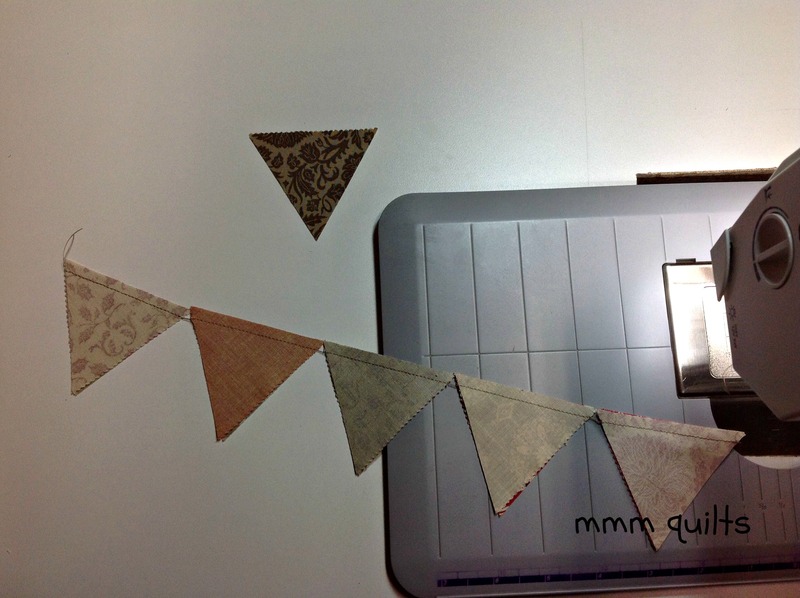 Draw a line marking this 2″ line. Sew along it, back-stitching at each end. 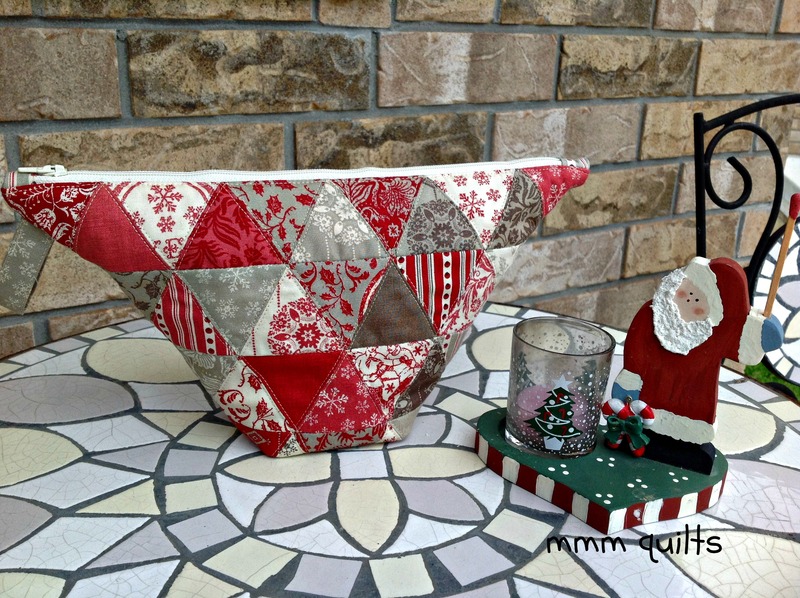 Just love how the triangles meet up! Do the same thing with the lining. Now turn the bag right sides out, pulling the bag body through the hole in the lining as you did before when you checked that all was okay. Turn in the edges of the opening in the lining 1/4″ and stitch them closed close to the fold. But it’s fine, and I just love how wide the top is: you can easily see all your junk/paraphernalia inside! One (or two, if you cut 64 triangles from your charm squares!) Pyramid Pouch! These would make great gifts, no? If you make one, I’d love to see it! This entry was posted in Bags and Totes, Charm Pack, Moderate, Seasonal and tagged Christmas, French General, Joyeux Noël, Musings of a Menopausal Melon - mmm quilts. What a fun pouch! Very unique and beautifully designed Sandra! Your instructions are so well done that even a beginner could make this up and be proud. Love the Joyeux Noel fabric line too! Sorry. I think this is kind of goofy looking. A waste of time and energy. 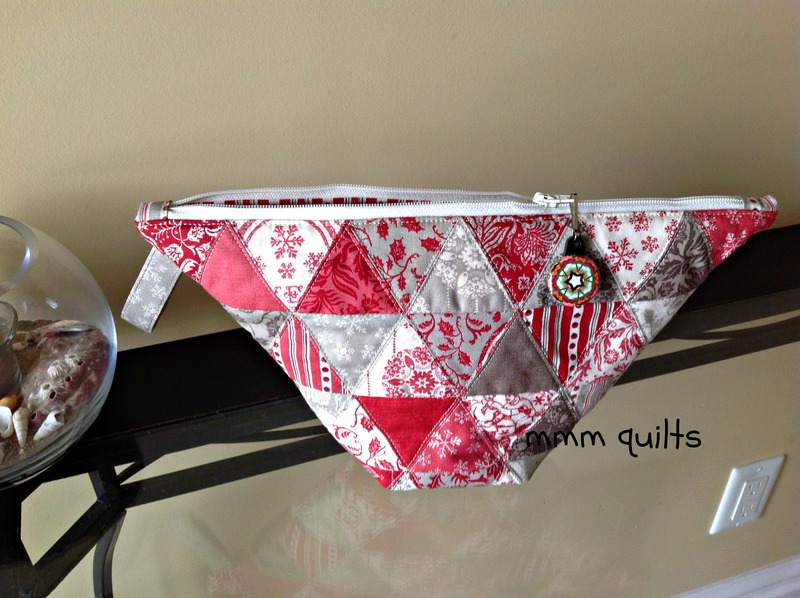 Beautiful pouch! Such a unique design. Love it! Sorry to say that I agree with Sandra W – I find it strange looking, too. (but did not dare to post my opinion until someone else had the same thought…. 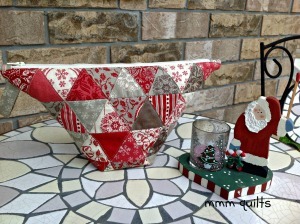 I find it delightful to see something new in design! There are so many copies of the same old ho hum, and this is fun looking. 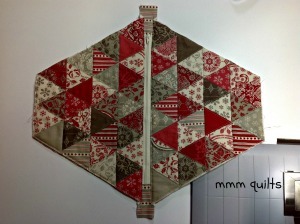 I can imagine it done in playful prints for kids, can’t you? They adore novelty bags! You’ve done a terrific job, Sandra, and I hope to see more here. Congrats on becoming a Bake Shop Chef and for such a wonderful tutorial! I have to agree with Sandra & CruiseFan. This is just a little odd and I have no idea how you would use this item. Congratulations on becoming a posted designer – I know I would never have the talent to design anything from scratch! Good instructions. 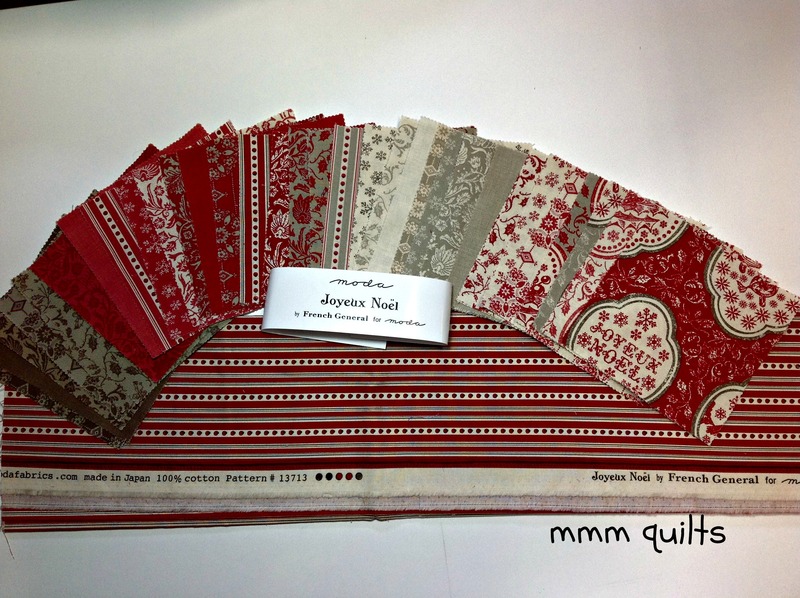 I really enjoy designing projects that are unique, putting a spin on something to push the limits of what we quilters have seen and sewn before. Whether you love ‘em or hate ‘em, I hope my designs make you think about trying something different. Sandra – this is such a fun, unique project! Congratulations on challenging our expectations and the limitations we place on typical designs. Sandra, congratulations on getting your pattern published! I am excited to try it. 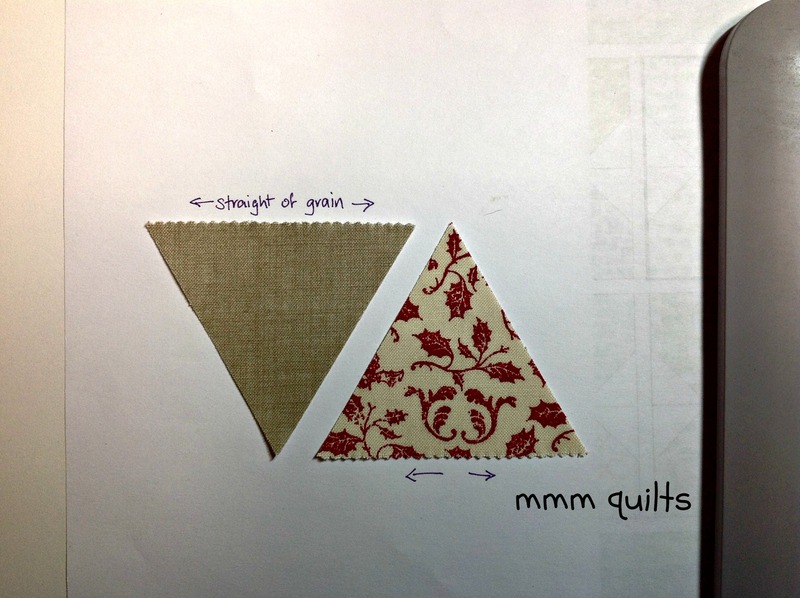 Something I really appreciate is the part of your tutorial where you teach us how to cut and sew with triangles, which I have not done yet. I can’t wait to stretch my skills and learn something new! Love the shape of the bag and the color is great too. Congratulations on getting published and the cutest bag. 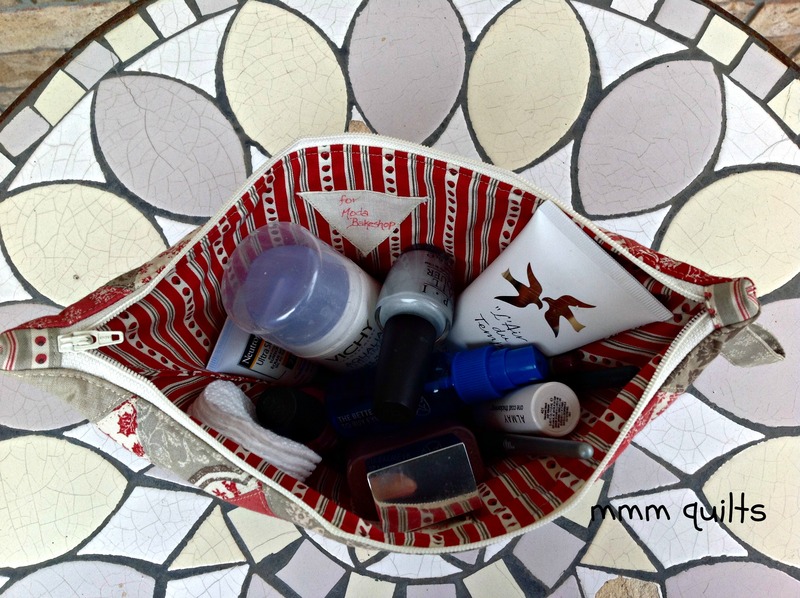 I love this bag and found it great for travel accessories. I love creativity and creative people (I’m not one of those people), but I did try creativity and make this bag upside down. The narrow end is the top (reversed from your diagram) and it works well for me. either way, it’s cute and a “different” kinda gift. Continue creating!! !